Reliance Jio has extended the Jio Celebrations Pack for some users to offer 2GB a day of additional data for free, offering up to 10GB data over the course of 5 days. The pack was initially launched back in September and brought as much as 10GB of total data benefits. The data benefits under the Jio Celebrations Pack come with five days of validity. Customers can view the benefits directly through the MyJio app. The latest development comes days after the Mumbai-based telco launched the Jio Diwali Dhamaka to offer customers with 100 percent cashback on recharge options above Rs. 149. The Jio Celebrations Pack in its current form credits a 2GB daily data voucher to eligible users. The data voucher is available with a five-day validity that translates into total data benefits of 10GB. It appears that the arrival of the pack is subject to data consumption patterns as it's not available for all users. 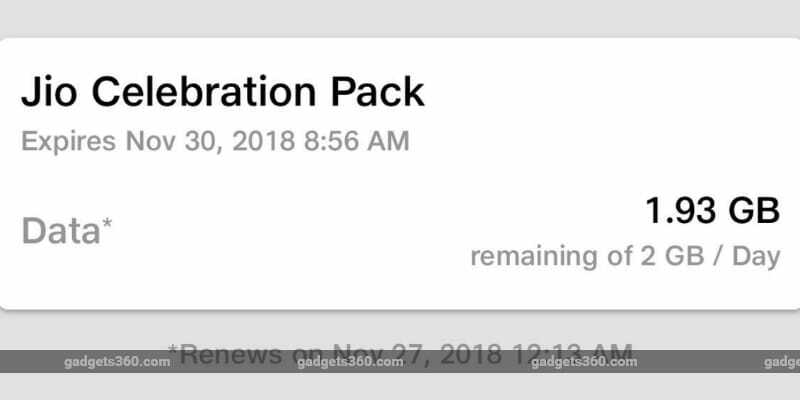 TelecomTalk reports that the benefits of the Jio Celebrations Pack aren't equal for all users - but offers a minimum benefit of 8GB additional data this month. As we mentioned, the Jio Celebrations Pack was initially launched in September. It brought as much as 10GB of total data benefits. The pack was initially planned to be spread across September and October as a part of Jio's second-anniversary celebrations.